What is a Living Ghost? The year is 1987. Any town U.S.A. Mother is sitting in kitchen. Younger brother and sister sitting in living room. Older son, comes home unexpetedly from work, walks around corner towards bedroom which was off of living room. Mother questions the two sitting in living if they seen the brother. The reply was 'no' from both. The mother asked repeatedly, thinking they were lying to her. They insisted that the older brother never walked into room with them and that he was not home. Agitated and in disbelief the mother recalls to the children what she had seen. It was blown off at the time, until the older brother came home from work. When asked if he came home earlier, the answer was 'no', which backed up the accounts of the younger siblings that no one had walked into the room with them. Remembering a certain color coat that she shaw the older child wearing, it was then discarded believing it was a bad omen some how. This was forgotten over the years and never really discussed..........until now. This story is true. The younger brother was myself. What had happened was an extremely rare manifestation. It is called a living ghost. 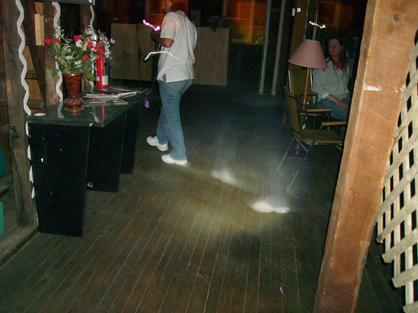 A living ghost, is really not even a ghost, but a soul or spirit of a person that leaves the body for a short period. What causes this? The person is in major distress or in danger. This throws the soul into an agitated state, to where the soul will actually leave the body for a short time and re-appear in a place of comfort, usually infront of loved ones. This can be hundreds, even thousands of miles away. Once the danger is over, it will return to the body. The person is not aware that anything has even happened. It is a type of out of body experience. After talking with my brother, who is an O.R.B.S. co-founder, he did admit that being a teenager and problems with school plus work he was under a lot of stress, causing major distress in his life. Although the actual account can not be proven, I remember this happening as if it were yesterday, even though it was 20 years ago. Can the spirit leave the body and return as it pleases? You decide.